Dental inlays and onlays are restorations used to repair rear teeth with mild to moderate decay or cracked and fractured teeth that are not damaged enough for a crown procedure. An ideal candidate for inlay or onlay has significant damage or decay in the tooth structure to be effectively treated using a filling, but has sufficient healthy tooth remaining to avoid the need for a porcelain crown. When is it recommended to use inlay or onlay? 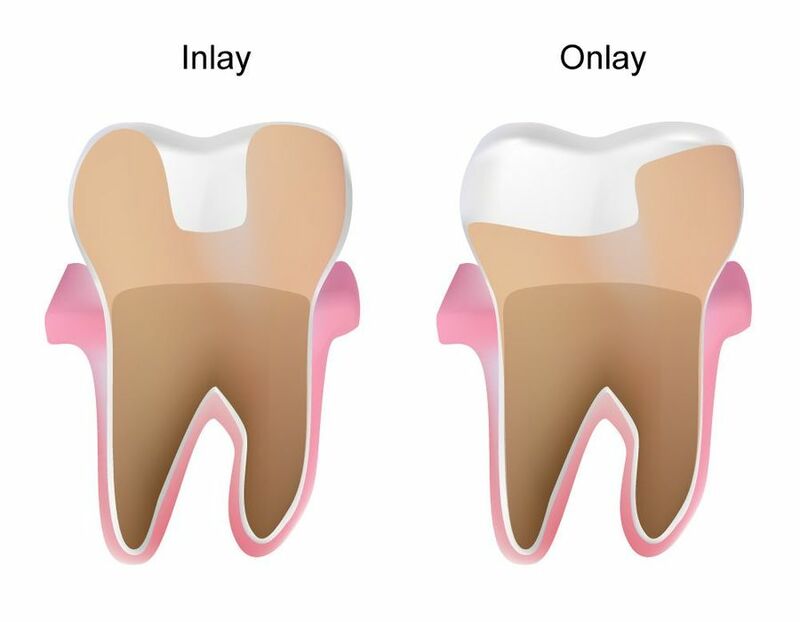 Inlay or onlay has to be used when dental caries are affect most of the tooth or there is a high chance that the surrounding tooth will be affected. Dental inlays and onlays are also used, when old fillings (such as amalgam filling) need to be removed or replaced. It is an ideal solution for replacing broken dental cusp too. Inlays and onlays are durable, thanks to the tough, hard wearing materials they are made from. Comparing to dental fillings that are composed of composite resine or amalgam, in most cases inlays and onlays are crafted from porcelain. This material can strengthen a tooth by up to 75 percent and last up to 25 to 30 years with proper care. They prolong tooth life, and prevent the need for further dental treatment in the future. Inlays and onlays are more conservative than dental crowns, that’s why they allow the dentist to preserve more of the tooth’s natural structure. They are made with the help of the modern CAD-CAM technology, that combines advanced comuter software, a 3D scanner and a milling unit. This technology allows precise fitting. Inlay/onlay doesn’t contain any allergic material, therefore it can be safely used. A dental inlay fills the space between the cusps, at the center of the tooth’s surface. A dental onlay is similar to inlay, but covers one or more cups or the entire biting surface of the tooth. An onlay is necessary when the extent of the damage is greater.